A "web application", also known as "website" or just "web", is a kind of application which uses client-server architecture built on top of TCP/IP network infrastructure. This has become an important part of every organization in the world. Lots of people around the world use organization's website as the way to find any information about organization, products, quality, and any other things specific for that organization. Therefore, it is important to understand how one can develop a website which will become a representation of the organization. In this sense, we may say that the website has become a sign which will represent the organization. An understanding of the sign systems as the key concepts in semiotics will be important for web engineer. Semiotics itself is a complex topic. Its root comes from ancient greek although at first it comes from medical things by Hippocrates (460 - 377 BC) to mean essentially a medical diagnosis, a disease based on 'sign' or known as symptoms. It was Plato (circa 428 - 347 BC) who took it away from medical diagnosis with his argumentation that human forms were deceptive things that did not stand for reality directly, but rather as a mental idealization of it (Danesi, 2004). Aristotle (384 - 322 BC), a pupil of Pluto, investigate the relation between forms and reality more closely. There are still many name who has big impact toward semiotics world but since we will not concentrate on historical perspective, we will not go into the details on semiotics history. We will propose some theories which will have impact towards our understanding of Web as a sign systems. A science that studies the life of signs within society is conceivable. It would be part of social psychology and consequently of general psychology. I shall call it semiology (from Greek semeion “sign”). Semiology would show what constitutes signs, what laws govern them. Sign or Representamen (e.g Saussure's signifier). Object: the thing that represented by sign. This could be physically real object such as "laptop" and "car", or abstract concept such as "bright idea" and "I don't care about the story that you told me and I feel boring". Interpretant: according to Peirce in his own words: "The Sign creates something in the Mind of the Interpreter, which something, in that it has been so created by the sign, has been, in a mediate and relative way, also created by the Object of the Sign, although the Object is essentially other than the Sign. And this creature of the sign is called the Interpretant" (see Bergman and Paavola, 2003). Simply put, it is the part of sign which is used to denote the meaning of sign by sign interpreter, the sense made by the sign. 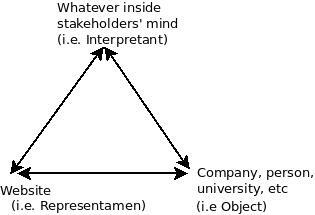 It is clear from the diagram that developing website should consider first about "what should be the interpretant"? We may then can begin our adventure to web semiotics by accomodating some theory from algebra, which is now known as "Algebra Semiotics". Surely there are many areas which affect the engineering of a website, for example, social aspect should be considered as an important part, the "knowledge" embedded into the website also make sense as a part of knowledge engineering, while we should not forget also many technical TCP/IP things and all other important software engineering topics related with the engineering of the web, and many others. In the future, I will dig deeper about Algebra Semiotics and how it probably can help developers in Semantic and Pragmatic Web. Daniel Chandler, "Semiotics for Beginner", http://users.aber.ac.uk/dgc/Documents/S4B/, accessed July 8, 2012 22:40. Marcel Danesi, Paul Perron, "Analyzing Cultures: An Introduction and Handbook", Indiana University Press, 1999. Marcel Danesi, "Messages, Signs, and Meanings: A Basic Textbook in Semiotics and Communication", 3rd edition, Canadian Scholars' Press Inc, Toronto, 2004. Martin Irvine, "Structural Linguistics, Semiotics, and Communication Theory: Basic Outlines and Assumptions", http://www9.georgetown.edu/faculty/irvinem/theory/Semiotics_and_Communication.html, accessed July 9, 2012 05:45. Mats Bergman, Sami Paavola, "The Commens Dictionary of Peirce's Terms", http://www.helsinki.fi/science/commens/dictionary.html, accessed July 9, 2012 05:16.